For a cheap hotel in Nantes it will take you away from the tourist center of the city or direct you to the chain hotels near the outskirts of the city. For a few euros more you can also find inexpensive locations in the center with the charm and more. If you choose a cheap hotel in the center of Nantes we recommend booking well in advance as cheap addresses are quickly full. Let's start with the Quick Palace , a low-cost and friendly hotel offering excellent value for money. Located near the exhibition center and La Beaujoire stadium. (6 Rue du Chemin Rouge). Expect to pay about 30 euros per night for a double room, hard to find cheaper, besides camping and hostel. In the same price, the Hotel Stars located in the north of Nantes, near the E62 / N844 motorway. Expect 15-minute drive to the center of Nantes, which is about 10 km distance. (3 Rue du Petit Chatelier). We continue our overview of the budget hotels in Nantes with the Hotel Longchamps , a budget hotel on the outskirts of the city that offers single and functional with private bathroom. The property has a restaurant and bar on site. (78 Route de Vannes). In another, the residence Cerise Nantes La Beaujoire offers fully equipped apartments and cheap can be rented per night, week or month . 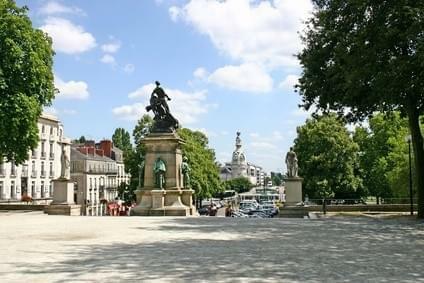 The residence is located in the central business district of La Beaujoire in Nantes, near the fairgrounds. (50 Rue de l'Ouche Buron). Finally finish our selection with the Hotel Renova , by far the most central hotel of all, since it is only 250 meters from the St. Peter and St. Paul's Cathedral and 5 minutes walk from the castle of the Dukes of Brittany (11 Rue Beauregard) .. This t offers rooms with private bathroom and free Internet access. Expect to pay about 45 euros per night to stay at this property. Quarter Hotel: downtown, St. Peter and St. Paul Cathedral . To book a hotel in Nantes easiest is via internet: the hotel booking sites are ideal for comparing offers and sort according to its budget. Additionally, specials are not rare, glancing regularly, it is common to come across a good deal. Do not wait the last minute to find your hotel and book your room in advance.